[Serve] supinate - pronate, or pronate - supinate - pronate? The last sequence must be to pronate. And more twist can be had when one supinates first before pronation. But during the toss to trophy position sequence, that is, before racquet drop, what do you do regarding arm twist -- neutral, pronated, or supinated? Good question. I'd start viewing high speed videos for each type serve. Note variety of serves for your questions. I'd also keep in mind the difference between internal shoulder rotation (ISR) and pronation especially since with a bent elbow during the time you asked about - the two motions then appear so entirely different of course. The most important biomechanical motion during that phase of the serve is ESR - the stretching of the muscles that do ISR. It only involves rotation of the upper arm bone at the shoulder joint and the bone itself does not move anywhere, the upper arm stays still relative to the shoulder joint- it spins like a top. Using the word 'pronate' makes everything ambiguous and muddles all discussion of what is happening, especially for this OP. I hope that each poster can define what exactly the meaning of 'pronate' that they intend. Or, just use the properly defined terms that can be Googled by everyone. Why do some tennis players use the wrong term for a joint motion? Some even know that it's the wrong term? Is that to confuse new readers? After 2000 years of academic progress on how the body moves.....................? In considering pronation, supination, ISR and ESR, it is essential to consider the masses of the forearm and racket and how they lag or move forward by inertia given the rapid motions of the serve. If you take a racket with bent elbow and accelerate the shoulder mass as seen in high speed videos, many of the effects on the forearm and racket (seen in high speed videos) can be simulated. Do so gently to avoid stress with just enough acceleration to see and feel how the forearm and racket move. If you want detail these are early measurements of joint motions during the serve. (Angular velocity measurements are also available.) I believe racket drop is 150 milliseconds before impact so you would have to find earlier data. But here is an example of how the full answer of your question might look. I believe that forearm pronation on the negative scale is supination, but see the original publication to check that. I marked ISR and pronation just before impact with yellow highlights. 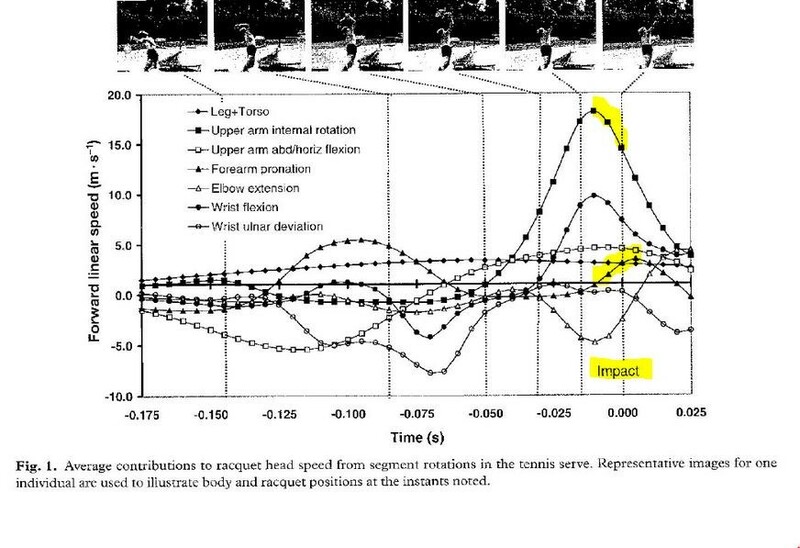 Before impact ISR is decreasing while pronation is increasing -- did the ISR forces just simply stop and the ISR is slowing and the inertia of the arm and racket caused the pronation? Or were the pronation muscles stretched - while the ISR was forceful and accelerating the ISR - but then shortened when the ISR backed off ? These were early measurements and the camera frame rate only sampled the serve every 5 milliseconds so I hope there are higher accuracy measurements now. Note - For defined usage the terms pronation and supination are used for both motion and location. The terms pronate or pronation are used to mean motion in the direction of maximum pronation angle, supination for motion toward maximum supination angle. The term pronation may also be used for the angular location from a defined "0" degrees. Likewise supination. As an example, the forearm may be pronating at 28 degrees per second while at the same time the joint is located at supination angle = 20 degrees. Note - two joints - one at elbow and the other at the wrist - are actually involved in pronation and supination. If you just "throw the racket" as hard as you can at the ball, will all of the right mechanics happen auto-magically? I have simplified my serve as follows. For flat and slice, imagine you are throwing the racket at the ball at an upward angle of 45 to 60 degrees or so (adjust the angle so the ball gets in during the warm up!). For a kick, imagine you are throwing the racket at the ball at a steeper angle (toss has to be appropriate). For me, taking the "thinking" out has done wonders. And totally relaxing the arm and upper body helps not only with generating pace, but also with keeping my back in good shape. It's not quite a Sampras serve... lol! ... but it has become a more repeatable and reliable serve. Do you see internal shoulder rotation (ISR) in high speed videos of your serve? To do stop action single frame on Vimeo hold down the SHIFT KEY and use the ARROW KEYS. I would throw the racket like a Tomahawk, end over end. It might be a good training tool. ? But it does not simulate the serve with ISR as far as I know or anyone has shown. Why is it good for training? Throwing a ball up does simulate some of the same arm motions as the tennis serve and with similar arm except the elbow has to have some changing bend for the ISR to produce hand speed. See Pat Dougherty video on throwing a ball for serve training. Throwing balls and rackets have become a perpetual subject for forum threads - there are never any high speed videos to see what is happening for the good throws. The Pat Dougherty video is not high speed. But the Pat Dougherty is the good evidence that throwing a ball up, as in the video, simulates parts of the serve. Step through this Youtube video frame-by-frame using the "." and "," keys. The video is not high speed but you can compare the throw at release to the serve at impact and see the similarities. There is a double image that shows arm positions. Interpret the double image for how the arm moves. @Chas Tennis : Maybe a javelin throw? I hear you, Chas... but since whatever I am doing has been working well the last few months, I should maybe count my blessings and not overthink the tech aspects. If there is little or no ISR so be it - but it does feel like my arm goes through the same motion as before but a little more crisply for a harder hit. I just hope it doesn't turn out to be a bad marriage after a good, extended honeymoon!